I should be doing 10 hours a week studying for my Open University degree but they have yet to release the next two units for the current study block so I am cruising along with nothing to work on. The Mustang is benefitting from that as I have now spent most of today working on it. Being a Revell kit, it doesn't have the part count of a Fujimi one so it isn't taking that long. I have also decided to stay with the chrome plated parts to save the effort of stripping the chrome and then repainting - first with a black primer and then with Alclad. 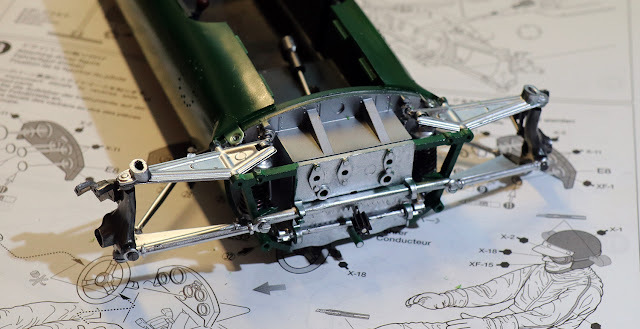 It always used to be necessary because the manufacturers always put the chrome plating onto black sprues so any cut points always showed and it was almost impossible to hide them. Nowadays, the chrome is plated onto white sprues leaving the tiny cut marks almost imperceptible. So the first step was to build the engine. 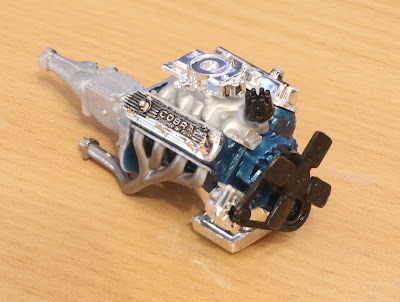 I am painting the car in Tamiya metallic blue so I used that on the engine block. I painted the cylinder heads with Tamiya semi-gloss black and then wiped it off, leaving the paint in the grooves. I think that worked quite well. 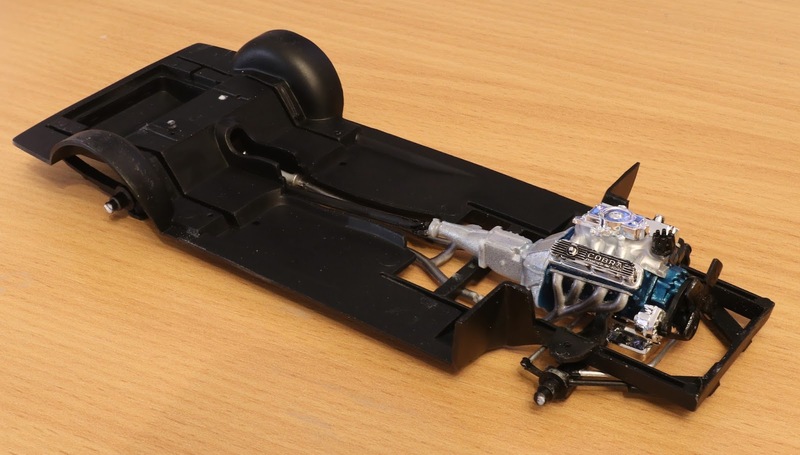 The chassis is the easy bit, given the fun that I have had with Tamiya and Fujimi suspensions. No such effort here. It is all moulded in one! The next stage is to make the dashboard. This is where I made my big(ish) mistake. I put the decals into the dash upside down. Mind you, once the dash is in place and the body on, no one will ver be able to see the results. Once I had fitted the steering wheel, the problem was almost out of sight. I am now working on the body shell and the main interior.I hope to get a lot done this evening and finish the whole thing off tomorrow - three days? I must be concentrating at last. I am working my way through the suspension of the car. I have managed to get the front suspension done OK. Note: I have yet to spray the etched radiator so you can see the super glue remnants through the grille. It all seems to work, including the steering but it is very tight so it won't take too much messing about. 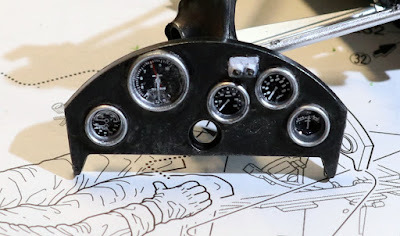 I have also completed the cockpit - remember, no seat belts in those days! 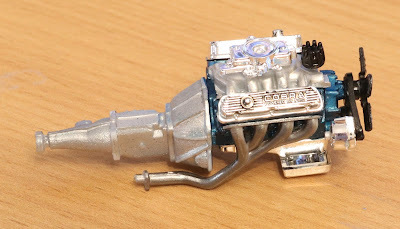 Following all of this, I started back on the engine, which meant attaching the rear suspension. This is where it all started to go wrong. 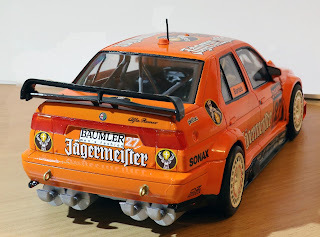 A few days ago, I had put together both sides; realised that I had got some of it wrong so took it apart; put it back and found that one of the suspension arms was stuck when it should rotate. I got this moving. 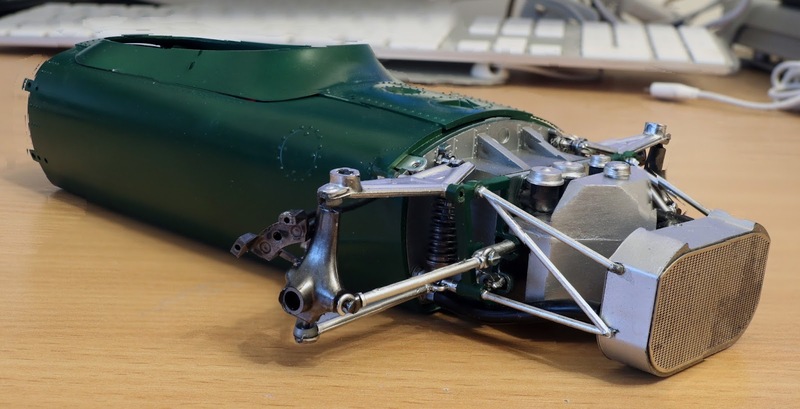 When I came back to it, I had to attach a link to that arm and found that it wouldn't come out of its mount sufficiently far for me to carry out the step. In trying to coax it out, it broke off. 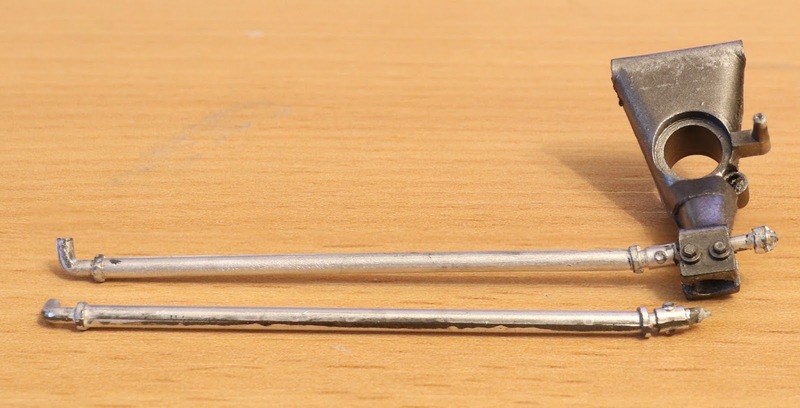 I decided that I would worry about this later and got on with the rest of the work only, when pressing down on the bottom wishbone, I heard a small crack and another part had broken off. Here are two images of the damage. (I will explain where the good ones came from next). Pretty dramatic, don't you think! Well, I thought so too but then a memory came from my SBX days. On Tuesday, I called up the Hobby Company, in Milton Keynes - they are the Tamiya importers. Giving them the kit code, I asked if they still can supply replacement sprues. "Yes", came the answer, "we can". I wanted the chrome sprue "D" so off he went. Whilst he was looking, I checked on their web site and there was no mention of the Lotus 49 kit so I presumed that it had been retired (again). He came back to tell me the bad news that they didn't have that sprue. I noticed that they did, however, still have the Gold Leaf TL 49B that had been re-released recently. Of course, as I discussed with the Hobby Company guy, that had the same engine and suspension. He, being of a similar era (but a lot younger than me, I guess as he was still out at work - smile), agreed with me. We sorted out that kit number and back he came with the good news. For the princely sum of #11.50 plus postage, I could have it shortly. In fact, it came on Thursday. In the meantime, I took the sprue from the 49B kit and got on. Now, I think that that service was as good as you are going to get from a kit importer and they should get five gold stars, if there were such things. So, back to the two images above - that is where the good versions came from. I am now a happy bunny once again and getting on with the build. Well, not quite. I don't find it gripping putting these suspensions together so, yet again, I am putting the kit down for a week or so. I have dragged another kit from the shelf. This time - sorry Dan - I am making a Shelby Mustang 350 for myself! This is going to be painted in Tamiya metallic blue - a colour that would have been impossible a few months ago as there was nowhere in town where I could buy Tamiya paints but now there is Hobbycraft! Yippee! 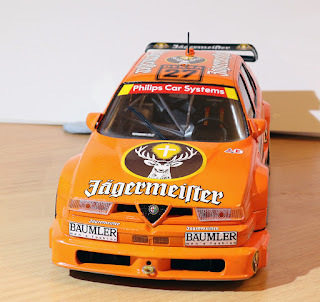 I had some fun spraying the Alfa with the Jaegermeister orange. These Zero paints are brilliant, so long as you don't have to touch up anything as they will not brush paint. I had to paint around all the window surrounds in black - to simulate the rubber - and a few bits ran over the orange. Luckily, I had a bottle of Vallejo flat orange which is nearly the same shade, so I used that. I have asked Zero/Hiroboy for some advice but nothing has come back yet. Anyway, the rest of the car went together beautifully. I did have one little bit where I kicked myself for my disbelief in Tamiya parts fitting. When putting the roll cage together there was on strut the went from the top back to the chassis. This has a pin on it but there was no attendant hole in the chassis. I thought for a few seconds and then cut the pin off. In the past I have told my wife "if something doesn't fit on a Tamiya kit it is because I have done something wrong!" On scanning the instructions just making sure that I had fitted everything, I came across one more strut for the roll cage. This fits in low down into the same slot as the part mentioned above. Guess what. It had one flat side and ---- a hole for a pin to go into! One last surprise was the little radio aerial on the roof. Rather then moulding one, they tell you to use stretch sprue. 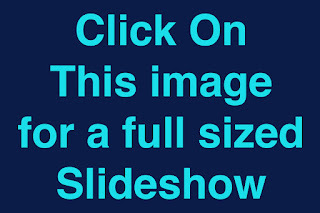 Now, if you haven't come across this idea before, this is what you need. 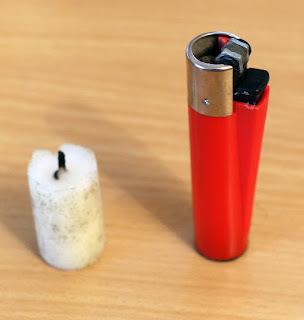 You light the candle with the cigarette lighter. 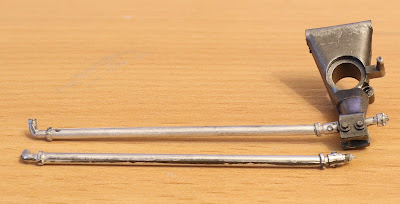 Then you cut off a piece of the unwanted sprue and hold it, gently, over the flame. When it begins to soften - and don't let it get too soft - pull easily apart and you end up with some really thin plastic rod. Once I had done this, I had to cut it to 10mm, glue it in place and paint it black. Why didn't they mould one? With that sorted, I got on with the decals. There are plenty of them and, unlike the BMW recently, they went on like a dream. One final coat of 2 Pack Gloss and it was ready for showtime. One thing is wrong - isn't there always one thing? I didn't put the aluminium protection above the exhaust pipes. They supply a small square of self adhesive aluminium sheet which you cut to size and the cut the slot for the towing ring. It looked like something I would screw up so it was safer to leave them off. If the bonnet (hood) looks a bit out of place, that is because I haven't glued it to the rest of the body as, this way, I can take the body off to show the interior. I am very pleased with this. I have a BWM 635CSi (like the one I finished recently) in Jaegermeister colours. 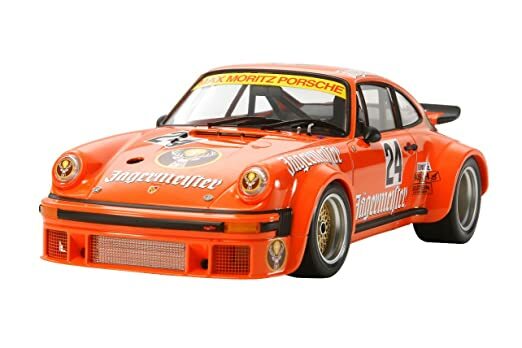 I am hoping to get a Tamiya Porsche 934 in the same colours for Christmas. 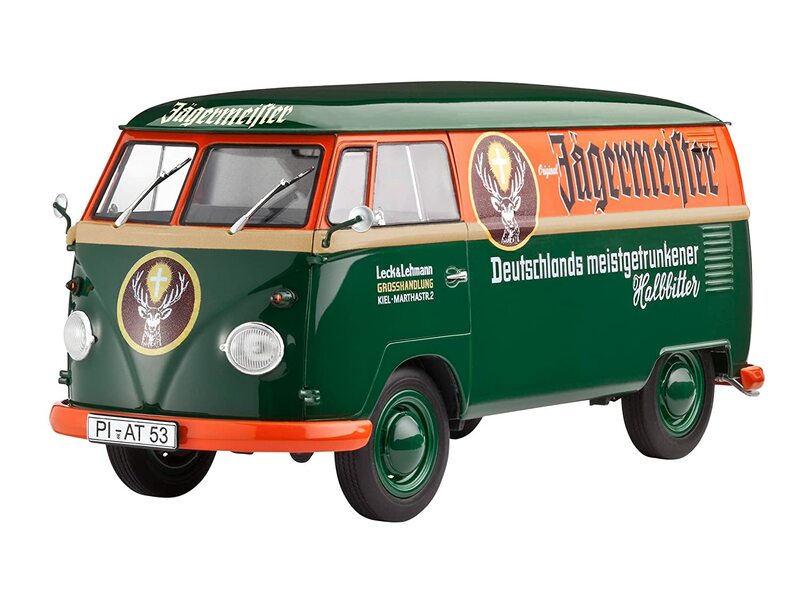 It seems that Revell make a VW van in Jaegermeister colours as well, so I will try and add that. So, now I am back on the 1:12thLotus 49. I have put the fiddly front suspension together and painted - and decalled - the dashboard. The kit comes with etched instruments but they are all solid nickel silver colour and didn't look right so I went with the decals. I think that they look just the part. Now, I have the rear suspension to fit together. Not a lot left to do, actually. I am quite surprised at that.